This is an update on the post I wrote about del.icio.us earlier today that showed massively decreasing traffic on the site according to Comscore, and flat traffic from Alexa. I spoke with del.icio.us founder Joshua Schacter this afternoon as well as Eckart Walther, VP Product for Search (Joshua’s boss) and Melissa Rische, PR Manager for Yahoo Search. They gave me some internal Yahoo numbers for del.icio.us to counter the comscore figures. I also obtained a somewhat useful Hitwise chart on del.icio.us traffic independently which is below as well. They also mentioned that they’ve grown from twenty servers at the time of the aquisition to over 100 today, and that any perceived lack of new feature launches is due to a move to the Yahoo MyWeb platform from the legacy del.icio.us platform. So overall, they painted a picture of a healthy, growing service, in complete contrast to most publicly available stats I’ve been able to find. I also managed to get some Hitwise data today for del.icio.us. 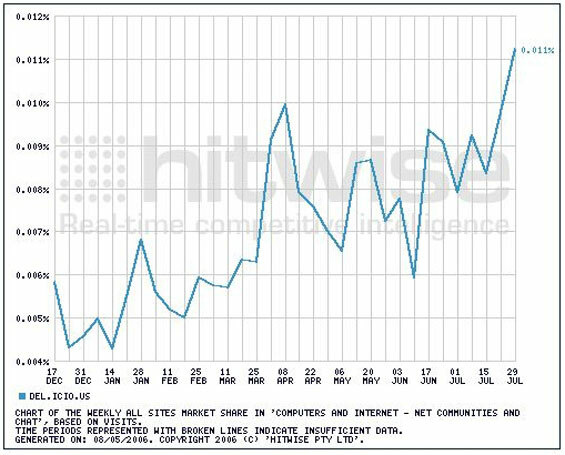 See the chart below showing market share v. “Computers and Internet – Net Communities and Chat”. This doesn’t add much, but it shows steadily increasing market share in this group of companies, at least. At the end of this process, after reviewing the public data (deeply flawed, but neutral) and Yahoo internal data (presumably accurate, but selectively disclosed), I’ve come to the conclusion that I have no idea what’s up at del.icio.us. I’m going to go with my gut and trust Yahoo. What concerns me most is not if Comscore is unable to perfectly measure audience, but if the flaws in their methods fluctuate over time resulting in unreliable trends and comparisons as well. At the very least, their data should be more statistically relevant and accurate than what Alexa shows. It appears that, at least for del.icio.us, it isn’t.